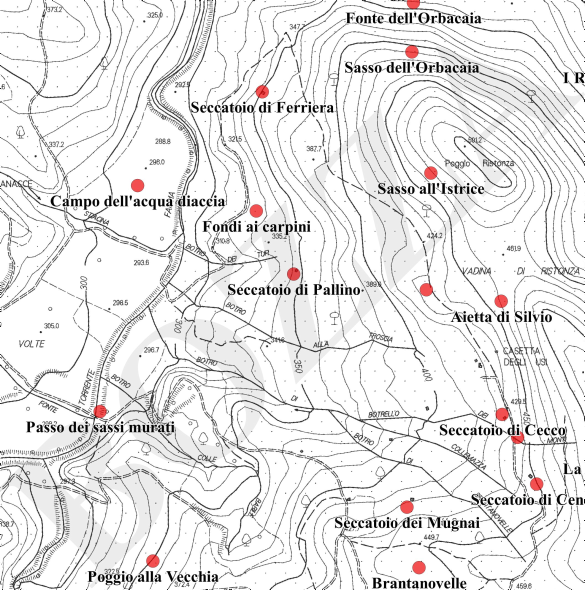 The Farma Valley Community Map was created by using as a base map the current Tuscan administration official base maps (1:10000 scale), interviewing the elders of the three villages (Torniella, Piloni, and Scalvaia), in order to document points of interest and other information which does not exist in the official maps, but is relevant for the locals. The toponyms thus produced are also published on the Regione Toscana Open Data Portal. Following a first data base created in 2015, the work saw a second round of activity during the 2016-2017 Winter. In 2017 the map is undergoing several integrations and additions. or write to info@pibinko.org for additional information.